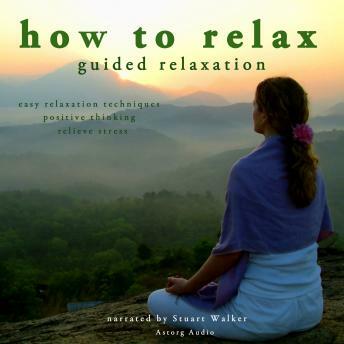 "How to relax, guided relaxation" is a method that enables you to reconnect with your inner resources and capacities to improve your health and achieve a greater sense of balance and wellbeing. Here are the tracks you will find in our method: relaxation techniques like breath counting, the relaxing sigh, letting go of tension, breathing for symptom control or release, abdominal breathing and imagination, step out of automatic pilot, mindfulness of the breath, slow countdown to go to sleep, exercices to prepare sleep, exercise the shining ball and the 12 steps stairway, a body scan mindfulness exercise, a mini mindfulness exercise, exercise for a perfect sleep. To create long lasting positive changes in your life, you have to look within yourself. You have the keys to feel better in your body, calmer, more confident, more positive and more grounded. Modern life, family problems or stressful jobs may have some consequences on your health and your wellbeing : all those problems can induce sleep problems, stress and anxiety related disorders, phobias, depression symptoms, burnout, difficulties to lose or gain weight, migraines and recurring headaches, addictions, digestives problems, chronic fatigue, stress related skin problems, and physical pain. Its necessary to find solutions and prevent those problems, and to learn how to meditate when necessary. Our audio method helps you to relax and to meditate with advices, relaxation exercises and meditation exercises. Find your inner peace, improve your concentration, dissolve stress instantly, learn to concentrate deeply.